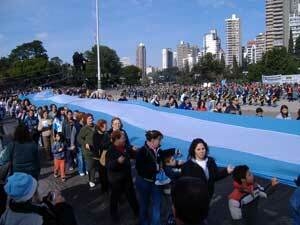 Argentina's Day of National Sovereignty is celebrated every fourth Monday in November. It marks the Battle of Vuelta de Obbligato which took place on 20 November 1845. To celebrate this national holiday most citizens get the day off and remember the history of the battle that proves the statement 'lose a battle but win the war'. Argentineans show their pride in their country by celebrating such an important day in history. Since 1974 the holiday has been celebrated on November 20th but was moved to the 3rd Monday of November to become a national holiday in 2010. The Battle of Vuelta de Obbligato was between the Argentine Confederation against an Anglo-French navy during the Anglo-French blockade of the Rio de la Plata. Argentina lost, but the wounds and damage from the battle got the best of the French and English troops making them ask for a peace treaty with Argentina.